As a work of inspiration, it has universal appeal-its themes remain fresh and glowing, as relevant today as twenty-five hundred years ago when the Buddha first expressed them. While the Dhammapada is a collection of teachings given by the Buddha at many different times and places, the effect is of a unified work. 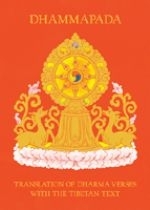 Over four hundred verses are gathered under the parasol of twenty-six different themes, forming a rich pattern that interweaves variations on many of the Buddha's most effective and moving teachings. The Dhammapada was one of the first Buddhist texts translated into English, with excerpts published in journals as early as 1830. In 1870 there appeared a complete translation by Professor Max Muller, a work that continues to be emulated. Reflecting its popularity, translations of the Dhammapada have appeared in nearly thirty different languages and in more than a hundred different versions. Even today, with many of the earliest versions still in print, new translations of this text continue to be published, for it is a wonderful text to work with: It is inspiring; it is beautiful; it is simple and clear. It was also in this century that the Dhammapada first appeared in Tibetan, translated by the outstanding Tibetan scholar, dGe-'dun Chos-'phel. Known for his great love for language, philosophy, and life, dGe-'dun Chos-'phel was also a poet and scholar, historian and translator, as well as a great traveler. It was in Sri Lanka that he took up the project of translating the Dhammapada into Tibetan. It is surprising that the Dhammapada was not already in Tibetan, for the Kanjur and Tanjur, the Tibetan Buddhist Canon, is the largest collection of canonical Buddhist texts in the world. Possibly the Dhammapada was deliberately excluded, on the grounds that the Udnavarga, similar in form and content to the Dhammapada, was already included in the collection. But there are many texts that have duplicates in the Canon-the Udnavarga itself appears in two places. So perhaps the exclusion of the Dhammapada was inadvertent. When the thousands of translations from Sanskrit into Tibetan were assembled into the Canon in the thirteenth and fourteenth centuries, a translation of this text may have been overlooked; the collections found in the great Tibetan monastic libraries were vast and the catalogues not always complete. But there is evidence that the Dhammapada was known in Tibet, for in the 1930s a Prakrit recension of the text in twenty-two chapters was found in a Tibetan monastic library by Rhula Sankrityyana, the Indian scholar. Several factors, including the length of this transcript, suggest that the Prakrit recension predates the Pli version. Rhula Sankrityyana made a total of four journeys to Tibet in search of Sanskrit manuscripts, travels that came in the wake of discoveries of important collections of old Sanskrit manuscripts in Nepal, Kashmir, and Central Asia. With these discoveries, India's interest in her Buddhist heritage awoke from a sleep of well over five hundred years, and Buddhist research of all kinds began to flourish. Dr. Sankrityyana's Tibetan travels resulted in the location of over three hundred Sanskrit manuscripts. Among those he was able to copy were various important texts that had long been considered lost in the Sanskrit. While dGe-'dun Chos-'phel almost certainly knew of the Prakrit manuscript of the Dhammapada found in Tibet, he chose instead to translate from the Pli. This decision allowed him to follow the Tibetan system of translation, which means working with a living exemplar of the tradition. Such a collaboration ensures that a translation is not only technically accurate, but also conveys the meaning of the text as expressed through a living tradition. It is difficult to accomplish this level of accuracy if one works only with the help of dictionaries or printed commentaries, or even with the help of ordinary scholars. In Sri Lanka, dGe-'dun Chos-'phel was able to work with a master of the Pli tradition. As he states in the colophon, the text was translated: "at the feet of the great guide and elder, Reverend Dharmnanda, at the monastery of dPal Ral-gri'i ri-bo in Sri Lanka." The collaboration was truly successful, for not only is his translation faithful to the Pli, but as with all great translations, it has the flavor of the original-elegant and lyrical, yet truly accessible. dGe-'dun Chos-'phel's translation of the Dhammapada is thus in the tradition of those whose aim was to gather together and preserve in Tibetan the whole of the living tradition of Buddhist teachings. Because of this, when Dharma Publishing produced The Nyingma Edition of the sDe-dge bKa'-'gyur and bsTan-'gyur in 1981, I felt it would be fitting to include dGe-'dun Chos-'phel's translation of the Dhammapada in the section of supplementary works. Since few have access to copies of this collection, we have also reprinted the Tibetan translation here, together with its translation into English. For students of Tibetan, we have also included a fairly comprehensive listing of Tibetan Dharma terms with Sanskrit and English equivalents. In the hope that this might be an inspiring workbook for all beginning students of the Tibetan language, we also included a simple Tibetan-English word list that includes most of the words found in the Dhammapada. This book is published in commemoration of the work of a remarkable man, dGe-'dun Chos-'phel. We hope that his vision of translation will be carried on by the Yeshe De Project, founded in 1983 to support translation of the texts of all Buddhist traditions.